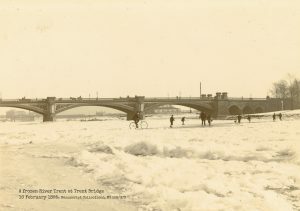 Swimming, sunbathing or sweating through a heatwave, or sledging, skating or getting stuck in the snow – extremes of weather provide people with strong memories of past events. Now, our new exhibition at the Weston Gallery, Nottingham Lakeside Arts, will showcase three years of research into these reactions. Many of the historical records and original archival documents which were discovered during the research funded by the Arts and Humanities Research Council (AHRC), will now be on display to the public. ‘Weather Extremes: Making and breaking records in Nottinghamshire’, has been jointly curated by Manuscripts and Special Collections at The University of Nottingham, and Professor Georgina Endfield and Dr Lucy Veale of the School of Geography. Extreme weather featured in the exhibition include a hurricane in 1715, heatwaves, and the so-called “Murphy’s Winter” of 1838. Irish-born futurist Patrick Murphy successfully predicted a severe winter and that 20 January 1838 would be a remarkably cold day. It proved to be the coldest day that winter: the Duke of Newcastle recorded in his diary on 21 January, “the thermometer last night was as low as 8 degrees, 19 degrees (fahrenheit) was the highest temperature in the day & some people have been frozen to death” (Ne 2F 5/1). The exhibition draws on the extensive collections held by Manuscripts and Special Collections to show how these events affected people living and working in Nottingham, including photographs of the frozen River Trent at Nottingham in 1895, drawings of the stunning sunsets in the UK caused by the ash cloud following the explosion of Krakatoa, Indonesia, in 1883, and souvenir pamphlets printed in 1932 to raise money for the victim’s of that year’s flooding. Also showcased are the dedicated local meteorologists of the 19th and early 20th centuries, such as Henry Mellish of Hodsock, and Edward Lowe and Arnold Tinn of Nottingham, whose daily recordings of the weather still provide key evidence for historical weather conditions and climate change. Professor Georgina Endfield, joint curator of the exhibition, said: “We are who we are partly because of the weather in which we live. Weather is locally seen and felt, frames and shapes people’s lives, and has been woven into human experience and cultural memory through oral histories, proverbs, folklore, narrative and everyday conversation. 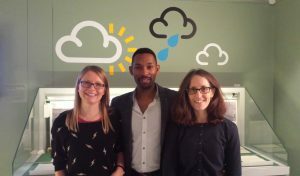 Prof. Enfield and Dr Veale were interviewed for BBC Radio Nottingham (listen here from 2hr53min) gave a tour to ITV weatherman and TV presenter Des Coleman, who – in something of a first for Lakeside – then recorded that evening’s local weather forecast in the exhibition gallery. The exhibition was formally launched by BBC Television weather presenter, meteorologist and University of Nottingham alumna Helen Willetts. 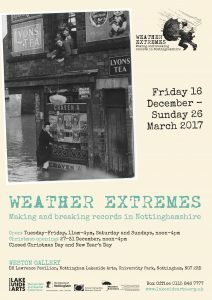 Weather Extremes: Making and Breaking Records in Nottinghamshire is open until the 26th March 2017. For more information or to see our programme of events visit our website. Find out more about the Weather Extremes Research Project or follow them on Twitter @Weather_Extreme. Manuscripts & Special Collections’ Reading Room is on King’s Meadow Campus, University of Nottingham. Email us to sign up for information about future exhibitions, follow us on Twitter @mssLakeside and @mssUniNott, or read our newsletter, Discover.